Green Home Building and Sustainable Architecture: Building with Grain Bins! I have become acquainted with some of the clever home and cabin designs of architect Mark Clipsham. He has been using steel grain bins to create monolithic buildings that resemble giant Structual Insulated Panels. Because grain bins are available in wide variety of sizes, it is possible to nest two of them together and then add insulation to the space between them. Since the components are basically "off the shelf," and can be incorporated into a variety of configurations, the cost of construction can be very economical. Mark claims that his designs can often be built for $50/sq. ft. or less! These structures are self-supporting, self-framing, highly insulated, maintenance free, disaster resistant, and recyclable. The same system can be used to make movable sound isolating interior partitions and exterior insulated, security panels, as well as go below grade for basements and frost foundations. This system can be used for anything from walk-in coolers to high-end resort hotels. Mark Clipsham earned an architecture degree from Kansas Sate University in 1985 and has been designing and building ever since. He is constantly on the lookout for sustainable ways of doing things. 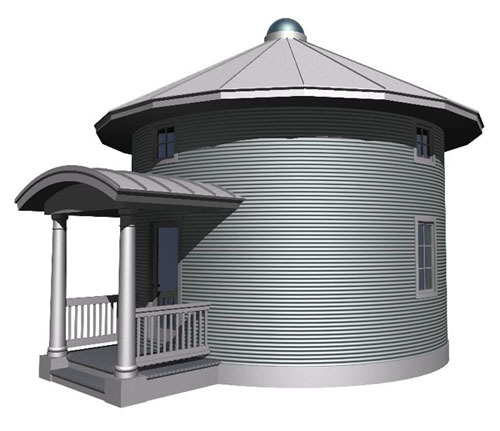 We have posted several of his imaginative plans at www.dreamgreenhomes.com, including Grain Bin Cabin, Lake House, and Tri-Arm. I prefer this shape to shipping containers. I think that these can be wonderful structures, but maybe not for neighborhoods in the city. Well, we could combine this with the shipping container.